For our second announcement of the day, Baby Steps 2 is coming back starting Sunday, April 5 at 3am PDT! Baby Steps 2 will be available to Crunchyroll members in the following territories: USA, Canada, South Africa, Australia, New Zealand, Latin America (Central and South America including Caribbean), UK, Ireland, Finland, Norway, Sweden, Denmark, Netherlands, and Turkey. 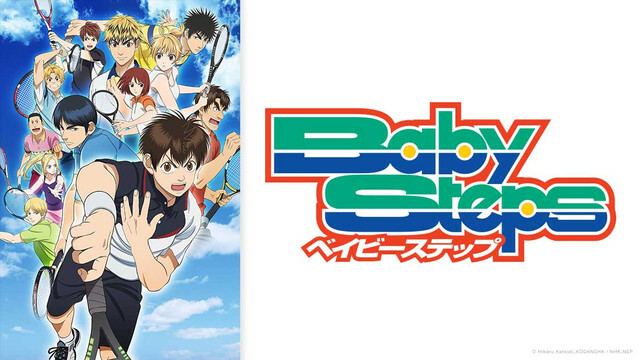 Based on the manga by Hikaru Katsuki, Baby Steps centers on an honor student named Eiichiro Maruo who becomes frustrated with his life and decides to join the tennis club. Despite lacking experience and physical strength, he utilizes his studious nature to develop a strategic approach to playing tennis.Taking notes of his opponents’ habits and tendencies, he is able to predict their next move before they even react. He also meets Natsu Takasaki, a beautiful girl with a passion for tennis. With her help, he aims to become a professional tennis player. In the second season of the anime, Hiroshi Kamiya joins the series voicing 19-year-old professional tennis player Alex O'Brien at the world-renowned IMG Academy in Florida, while Megumi Han voices the role of his sister, Marcia. Spring is here at Crunchyroll and that means the start of our Spring 2015 announcements! And now, we're excited to announce the sequel to last season's comedy short, I Can't Understand What My Husband is Saying: 2nd Thread starting on Thursday April 2 at 11:30am PDT for users worldwide except Japan! The hilarious otaku-comedy short returns this spring with I Can’t Understand What My Husband is Saying 2nd Thread! The follow-up to last fall’s dark horse hit, otaku husband Hajime and his OL wife Kaoru are back for another season highlighting their hijinks as a newly married couple. Voice actors Yukari Tamura and Kenichi Suzumura are back once again reprising their roles as Kaoru and Hajime, respectively, as well as singing the opening theme: “Yuruganu Futari ~Ai no Sanka~”. 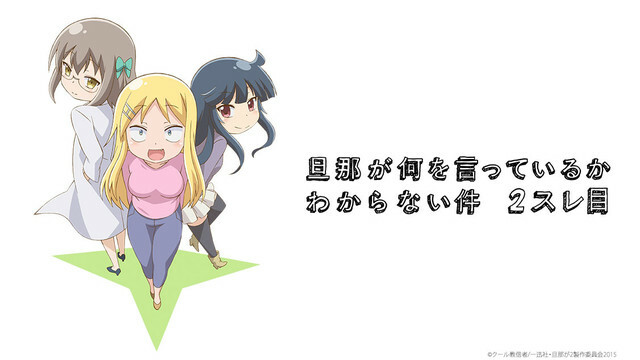 Animation production will be handled again by Seven, with director Shinpei Nagai also returning to write and direct the second season as well. As usual, keep your guys to Crunchyroll as we continue to announce our new Spring titles in the upcoming weeks! This makes me so happy! I loved this! If you're reading this, then you're probably a throat. Well that one was expected. Not that i am complaining. "I Can't Understand What My Husband is Saying" is a good one to see on the new spring list! Already a great start! ERROR: 0% coffee found in system, reboot application. My Anime List lists Fafner with 13 episodes, and in CDJapan only are 6 DVD/BD volumes listed (same total chapters), so I don't think it continues into Spring . I'm hoping that at the end of the next chapter they announce something like "to continue in summer/fall 2015" because it was said to be a 26 chapters series back in the day when it was announced this 2nd season. We just have to wait and see what happens . PLEASE announce Omakase Mamitasu! I was really looking forward to it! Arslan Senki will likely be licensed by Funi. Either way, at least it will be streamed legally. Unlike series like Amagi Brilliant Park. Off to a decent start today. Nice. Sure, why not. I'll watch those two shows since I already watch their previous seasons. Just too bad it probably won't be legally available outside of the US then. Rather hope crunchyroll gets it. Why do you think Funi will get Arslan?